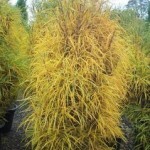 A narrow, upright shrub with deep green, finely textured, foliage that turns a golden yellow in the fall. 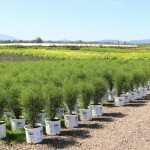 It is a good plant for narrow hedges, as an accent plant, or in containers. It is non-invasive (the rarely produced fruit is sterile). It prefers well-drained soil in full sun to part shade. PP 14,791.